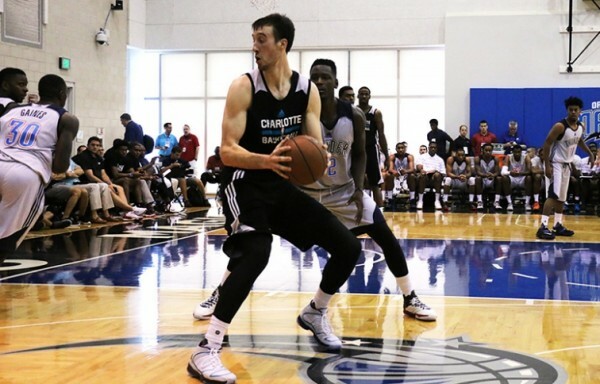 The Charlotte Hornets first round draft pick, Frank Kaminsky, probably gave the strongest performance on the first day of the NBA Summer League in Orlando out of the rookies in action, although Mario Hezonja, Stanley Johnson, Justise Winslow and Myles Turner didn’t do too badly either. Kaminsky, the 9th overall pick in the draft coming off a huge year with Wisconsin and four years with the Badgers overall, had a slow start in his summer camp with the Hornets, but Patrick Ewing has done very well in bringing him to the right kind of confidence level, enabling him to show his scoring skills which are quite impressive for a man his size. Kaminsky played on the losing side as the Hornets lost to the Thunder 76-74, but Kaminsky scored 19 points to lead all players in that game, alongside 12 rebounds, including 4-of-8 from beyond the arc. P.J. Hairston scored 13 points for the Hornets, while the Thunder were led by Frank Gaines with 17 points. Gaines went undrafted in 2013 and has since played overseas and in the D-League. The fifth overall pick, Hezonja, scored 12 points in his debut, playing for the Orlando Magic Blue team, but made the strongest impression with a game winning 3-pointer in a 75-74 win over the Los Angeles Clippers. Aaron Gordon, who didn’t have a very good rookie year, looked great for the Magic with 22 points and 18 rebounds. Stanley Johnson looked good for the Pistons in their loss to the Orlando White team. Johnson came off the bench to score 13 points. The 8th overall pick who is just 19 didn’t mind coming off the bench, knowing it’s going to be his role during the regular season with the Pistons, at least initially. In the 92-76 win for the Miami Heat over the Indiana Pacers both first round draft picks impressed the most. Justise Winslow scored 15 points for the Heat, showing Miami have something to be confident about heading into the new season, or in other words finally a rookie that’s not going to disappoint. Myles Turner, the 11th overall pick for the Pacers and maybe the team’s starting center next season scored 20 points to lead all scoring in the game.